Last night, Nathan had his Christmas musical for school. 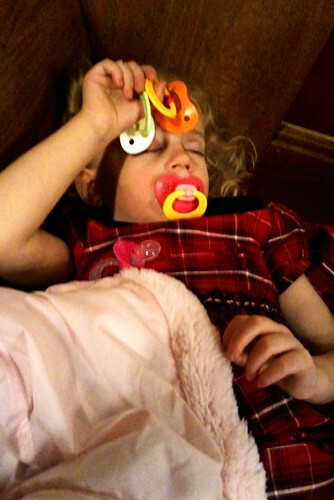 It was a LONG day for me, because Autumn woke up at least 12 times the night before because she had a cold/cough. Then, no nap at my Mom’s even though her cough got a lot better. I was really worried she was going to be a little bit of a handful by the time we got to church at 6:30pm (then 7pm was when the musical started). I lucked out because she fell asleep on the pew right when the musical started and stayed asleep the entire time. I was able to fully enjoy the musical, and she got some much needed sleep! I was SO lucky!!! 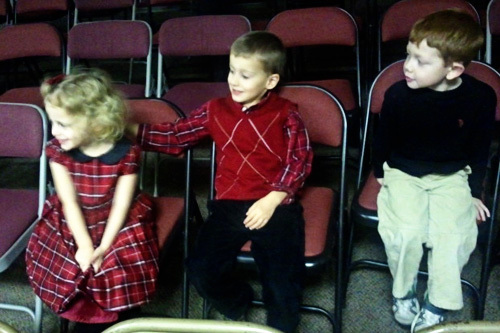 Here is Nathan, Autumn and Nathan’s friend Dylan before it started. I have a Galaxy S for a phone and it just does NOT take good photos of kids, I always get blurry messes! Oh well! I just wasn’t feeling up to bringing my big camera, especially since they weren’t allowing photos or videos during the musical. I’ll try to post a picture that the professionals took of Nathan once I get it back. Autumn fast asleep with her binkies (darn those binkies!) on the pew. I am planning to take away the binkies tomorrow evening cold turkey. I just can’t see how any other way will work at this point… it is going to be a total nightmare for me! She is so attached to them. I really need to figure out a Binky Fairy plan of action or something. Nathan did a really good job, he sang and did all of the arm motions to the songs. They even got to wear sunglasses for one of the songs. I am so proud of my boy, he is growing up so fast! Nathan got a little bag of goodies afterwards. 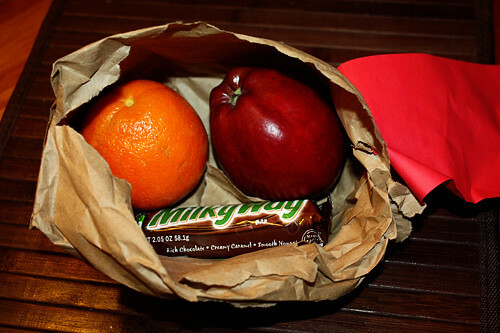 Fruit and a candy bar! Ha, ha! Good combo, I guess!